A great all-round bass that has much going for it, tonally flexible and a real joy to play. Well done Marvit! Great looks, well finished and plenty of tonal options to play with. May face stiff competition in this price range. Following an impressive display at the London Bass Guitar Show earlier this year, the guys from Marvit are producing some eye-catching instruments for us to salivate over. Natural finishes appear to be the order of the day: this Apofi model is no exception and comes fitted with a combination of Aguilar circuitry and pickups. So do the sum of the parts add up to create a great playing experience? The first thing that hits you is that it's quite a bulky instrument but surprisingly it doesn't feel overly heavy, weighing in at around 3.8 kg. With all of the neck and body laminates, it feels quite organic, while the thick gloss lacquer applied to the body and neck gives it that 'newly finished' feel. fits well with the lighter maple through-neck. The upper body horn stands out, not unlike recent Carvin models, which restricts the upper cutaway somewhat, although the lower cutaway offers good access to the upper frets. With contouring to the rear of the body and upper chamfer, the fully-rounded body is comfortable to wear and balances well, with only a small amount of neck dive when off the strap. The neck profile is equally full and rounded with a pronounced 'C' shape: have no fear in the comfort stakes, the broad 24-fret ebony fingerboard tempts the player to get stuck in. There's no lack of playability with this bass. The matching spalted maple-faced headstock adds a touch of class, while the mother of pearl inlays, in the shape of bass clefs and fortissimo symbol notation, make a pleasant change as position markers. The level of finishing is first class, with no sharp frets in evidence on the underside of the neck, and across the whole bass it is clear that significant attention has been paid to every detail. Lightweight gold Schaller hardware has been used, said to be 40 per cent lighter than their regular standard bridges and machine heads, while the control set for the Aguilar circuitry is predominantly black (volume, volume, bass, middle, treble, passive tone control) aside from a gold active/passive selector switch. The mid control has a push/pull option to select the mid frequencies to be cut or boosted, which is always handy mid-performance for an extra boost in signal, while an Aguilar hum-cancelling P/J pickup configuration has been used. With so much timber in the construction mix, we were concerned that there might be too much of 'everything' going on, especially with the extensive Aguilar preamp - but we were pleasantly surprised. 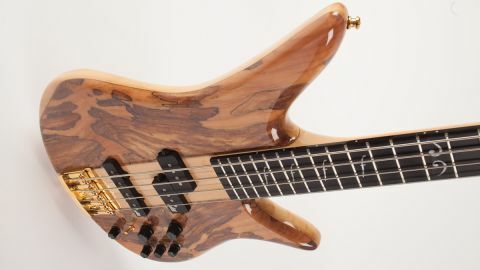 Even though this bass has a smooth acoustic tone, we thought it might have a throaty high-mid bark that couldn't be EQ-ed out, but if anything, it was unexpectedly warm, with a smooth bottom end, a powerful midrange and a clear treble response. the EQ that there is an obvious shift upwards. The passive mode, with the passive tone control, is very usable in its own right. String volume across all four strings is pleasingly even and with this circuit and pickup pairing, there are plenty of tonal options available. By having two volumes instead of a pickup pan control, it is possible to add just the required amount of signal from each pickup to suit your tonal preference, so soloing either pickup highlights the respective character and tone you would expect of a split-coil in the neck position and a single-coil in the bridge position. Experimenting with volume settings for each pickup is very much called for before adding the EQ into the mix. However, you can be assured that the Aguilar circuit has a tonal palette to cater for all playing tastes, without being excessive or overpowering, or turning the treble response into a clattery, overly twangy and brittle signal. Our review notes said 'very big, very glossy and very lovely' and that is exactly what this bass is. Although it feels substantial, it doesn't feel heavy - and that is very much to its advantage, as it performs very well with a high degree of comfort and playability. It certainly works in any musical context you wish to throw at it and we can see many a player being interested in what it has to offer. We heartily recommend checking this bass out should you have the opportunity.